So maybe starting off a wishlist with Tom Ford is pushing it a bit, but look how beautiful it is! I love all the shades in this quad, especially the top right shade, a beautiful bronze colour! If I had the money, i’d have ordered this already. It’s currently available online for around £50. Next up is a gorgeous YSL lipstick, i’m really going for it on the high end this month aren’t I? Well, a girl can dream. Whenever I see other bloggers talking about YSL lipsticks, the one thing they always seem to have in common is the quality, I guess that’s what you’re paying for! Apparently they’re highly pigmented, creamy and easy to apply and super long lasting. This first shade from their Rouge Pur Couture range is just beautiful. I might have to buy this as an early birthday present to myself. It’s available to order online for around £22. Everyone’s got a Nars Blush right? I’ve been putting Nars blush’s in wishlists for the past year or so and i’ve still not managed to get my paws on one! Now that i’ve come across this one, I don’t think i’ve got any choice other than to order it right now! I chose the shade Amour because it’s a lovely matte, strong, pink shade which I think makes it pretty versatile in the sense that I think it’d suit most skin tones. Apparently it is super pigmented so i’d probably have to apply this rather lightly to avoid looking like Barbie, but it’s still a beautiful shade. You too can grab this blush now for £22.50. I’m sure everyone’s seen the advert for this mascara? The one where the model has a Deadmau5 esk mask/giant head on and they say manga about thirty seven times? I actually thought the advert was pretty awesome to be honest and swore to myself that I’d buy the mascara, yet here I am adding it to a wishlist, oops? I’ve heard that it’s a pretty fab mascara for volume and i’m always looking for more volume, my eyelashes are pretty pathetic to be fair. This mascara is available in Boots for £8.99. I can hold my hands up high and say that i’ve never owned ANY Topshop make up, this has to change! They have such a wide variety of shades, not only in lip colours but in things like nail varnish too! I’ve written about their products a million and one times, so I think a little spree is in order. This particular lip crayon is in the shade “Secret Party,” c’mon, even the name is awesome! Secondly, it’s a beautifully blue under toned, bold, matte colour, #winning. The link above is to the John Lewis website, but I suppose you could grab this in store at Topshop too! Last but not least we have this simple yet really lovely make up bag! I recently received(thank you Nolan!) a beautiful Zoeva make up brush set and it came with a lovely make up bag BUT it’s so beautiful that I don’t want to use it! How sad am I? When I saw this I knew it’d be perfect for my brushes! Modcloth always have such lovely and sweet pieces. This is available now for around £15! That was pretty hefty wasn’t it! 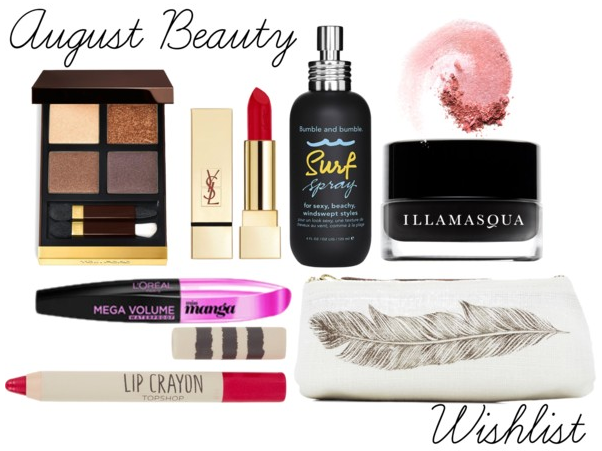 What are you lusting over this month in the world of beauty? Let me know below! Have you made any payday purchases? You've put together a beautiful wishlist! I would have a YSL lipstick on mine too!…One day ha! That lip crayon is so cute. I want one too. And I've been hearing a lot about Nars lately. Great finds. I want to try that surf spray so badly! This makes me want to buy things.. haha! I have always wanted to try something from the bumble and bumble, but it's a bit expensive.